CHRISTMAS COMES BUT ONCE A YEAR and so do the attendant Christmas Markets dotted around the UK in, its larger cities in particular. 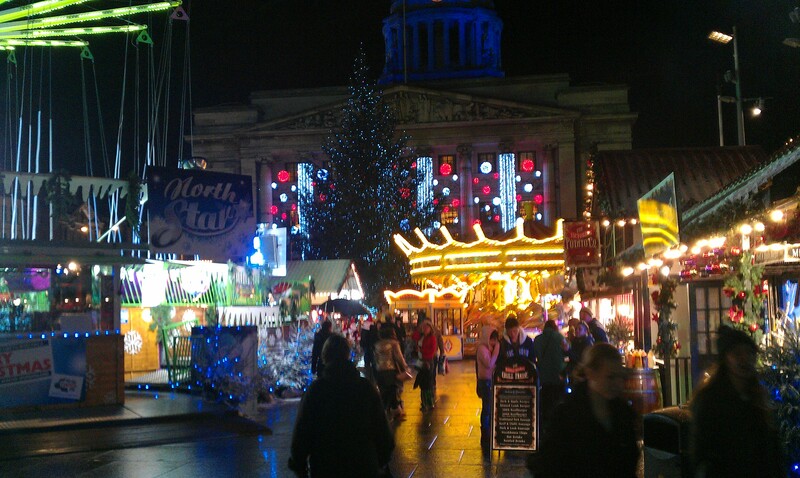 Here in Nottingham until a year ago, we had a German Market placed in and around the large Old Market Square in the centre of the city. This was replaced last year when, in the dying days of November, a much-vaunted ‘Victorian Fair’ came to take its place. I’ll not try to claim any of these events as being terribly authentic in any way. The goods tend to be expensive too, but at least they provide a little mid-winter atmosphere around the city centre which could look a little barren and grey in the faltering light and damp pavements at the end of the year. In previous years I particularly enjoyed seeing the busy outdoor skating rink laid out as a centre piece in the Square. Although of course artificial, it exuded a pleasing Winter ambience and truth be told, people appeared to like it as it always seemed well-used when I was passing there, which was often. Conveniently close by was a simple beer stand where one could wash down a delicious Bratwurst with a pint or two of excellent German Paulaner out in God’s good fresh air. Last year things changed with a larger licensed bar in the form of a Canadian-style hunting lodge. The concept was pretty hokey, what with its pair of old white figure skates hanging on the wall (in a hunting lodge!) a scattering of furniture and a fur rug or two. It was however warmish in there which was a bonus, even if the drinks had been largely demoted to bog-standard beers sold in any old pub. This year I popped into the Square on the evening of the 23rd November for the annual Christmas tree lights switch on and was quite disappointed in what I saw. Centre stage in place of the skating rink was a huge fairground ride which I believe is called the ‘North Star’. 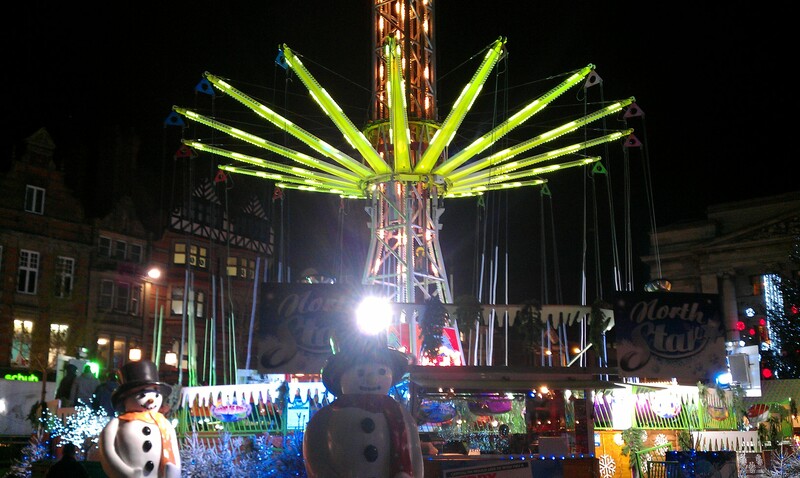 The Council’s blurb describe it as sixty metres high and it is totally out of keeping with a Christmas Market. It actually looks quite ridiculous. Wandering around I also noticed a fairground merry-go-round, which for the life of me I can’t link to Christmas and other smaller rides which I’ve subsequently seen deserted and only manned by bored-looking operators. There’s a large bar which is excitedly billed by the council as a ‘Narnia’ experience. It’s basically a large open-ended shed that sells beer with a smaller room through a ‘wardrobe’ door. There’s mulled wine and Staropramen amongst other things on offer. I did enjoy an excellent pint of Briska Swedish perry which was very refreshing. I won’t be taking too many of those though at £3.80 a pint. Small stalls snake along Long Row and Wheeler gate in what is a larger event for 2011. Many of the businesses however are generic, anytime anywhere affairs which have little to do with the festivities at this time of year. So, on balance, I’m pretty disappointed. I’ve enjoyed socialising with friends on the Christmas Market in Nottingham many times but can’t see that happening so much this year. The Nottingham City Council seem to have capitulated to a lack of cash but more obviously a lack of imagination. 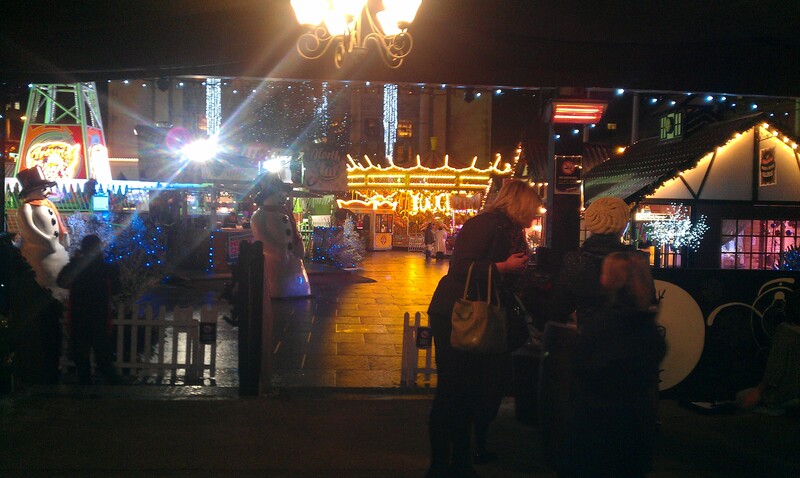 The same fairground operators once again dominate the Square as per usual, yes we’ve noticed and you’re not fooling us Nottingham City Council, making it more like Goose Fair with artificial snow. It’s all a bit cheap looking. Verdict: could do better – much better. I’ll be looking for the spirit of Christmas elsewhere this year. So I take that there is no Christmas tree in the ‘square’ anymore? Yes, there was a Christmas tree in front of the Council House as always, Bryan. It’s a shame that it, and the real spirit and feeling of the time of year seemed to get swamped in what was basically a winter funfair. I’d like to see a lot more accent on Christmas.